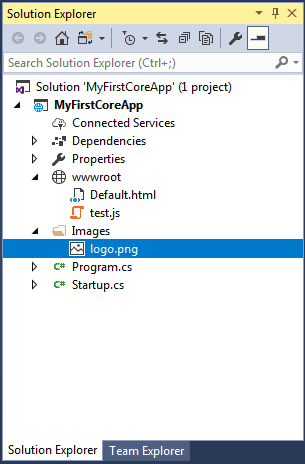 ASP.NET Core application cannot serve static files by default. We must include Microsoft.AspNetCore.StaticFiles middleware in the request pipeline. The Microsoft.AspNetCore.StaticFiles middleware package is already included in the meta package Microsoft.AspNetCore.All, so we don't need to install it separately in ASP.NET Core 2.x application. 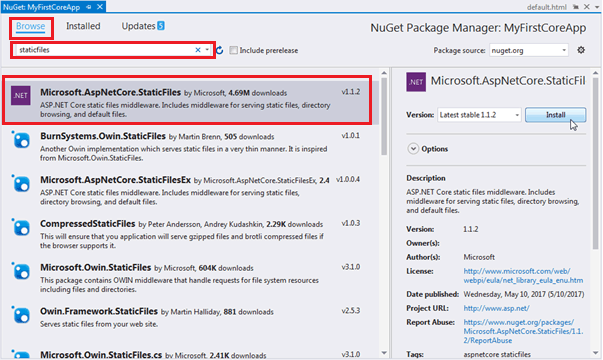 To install StaticFiles middleware in ASP.NET Core 1.x application, open NuGet package manager by right clicking on project in the solution explorer and select Manage NuGet Packages... Search for staticfiles in the search box in the browse tab. This will display Microsoft.AspNetCore.StaticFiles middleware as shown below. Click on the Install button on the right pane to install it. 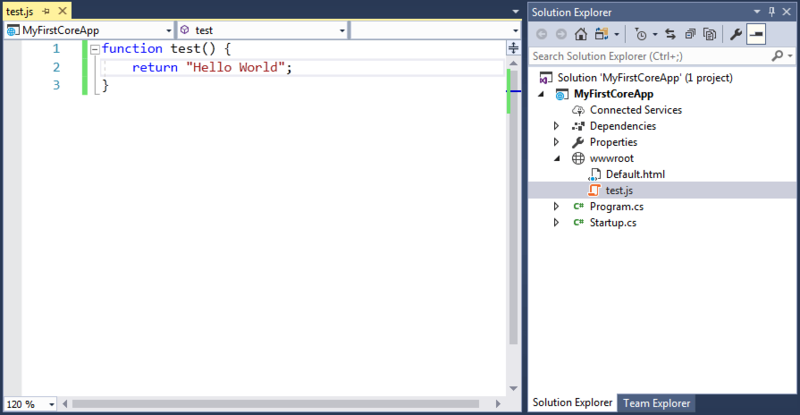 Once installed, the Microsoft.AspNetCore.StaticFiles is automatically included in the dependencies section of the project.json. By default, all the static files of a web application should be located in the web root folder wwwroot. To understand this, let's create a simple default.html in the wwwroot folder with the following content. Now, to serve the above Default.html static file, we must add StaticFiles middleware in the Configure() method of Startup file as shown below. As you can see above, the app.UseStaticFiles() method adds StaticFiles middleware into the request pipeline. The UseStaticFiles is an extension method included in the StaticFiles middleware so that we can easily configure it. Now, open the browser and send http request http://localhost:<port>/default.html which will display default.html as a response as shown below. This way we can serve any other file stored in wwwroot folder or sub-folder. For example, consider the following test.js file in the wwwroot folder. Now, we can access this file by sending http://localhost:<port>/test.js request. Suppose, you want to serve files from the outside of web root folder (wwwroot). For example, you include images in the following Images folder as shown below. Now, specify StaticFileOptions parameter in the UseStaticFiles method to serve images from the Images folder as shown below. As you can see, we used FileProvider option to specify Images folder from which static files will be served. The RequestPath option specifies the relative path in the URL which maps to the static folder. Now, a request to http://localhost/app-images/MyImage.png will serve the MyImage.png file. 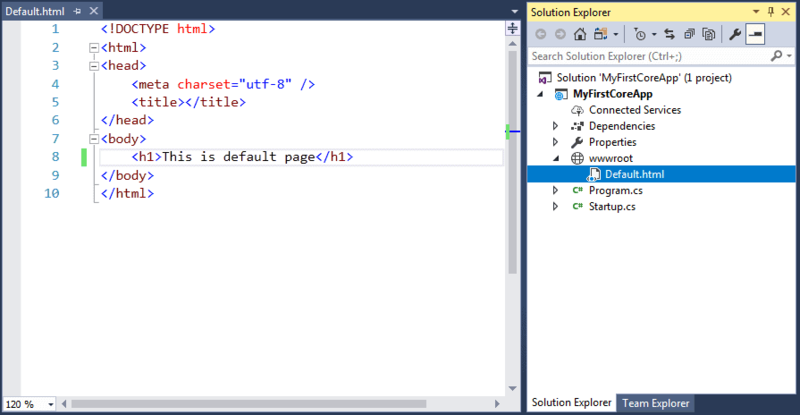 As we have seen above, default.html or test.js was served on the specific request for it. However, what if we want to serve default html file on the root request? 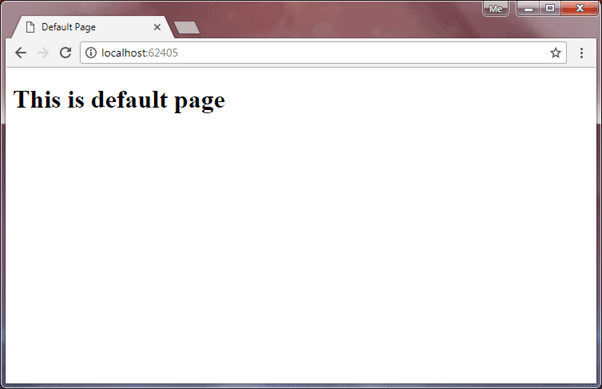 Currently, when you send http://localhost:<port> request, it will be handled by run method and display the following result. To serve default.html on the root request http://localhost:<port>, call UseDefaultFiles() method before UseStaticFiles() in the Configure method as shown below. The UseDefaultFiles configures the DefaultFiles middleware which is a part of StaticFiles middleware. This will automatically serve html file named default.html, default.htm, index.html or index.htm on the http request http://localhost:<port>. The above example will display default.html file on http://localhost:<port> as shown below. Order of middleware is very important. app.UseDefaultFiles() should be added before app.UseStaticFiles() in the request pipeline. The FileServer middleware combines the functionalities of UseDefaultFiles and UseStaticFiles middlware. So, instead of using both the middlware, just use UseFileServer in the Configure method. 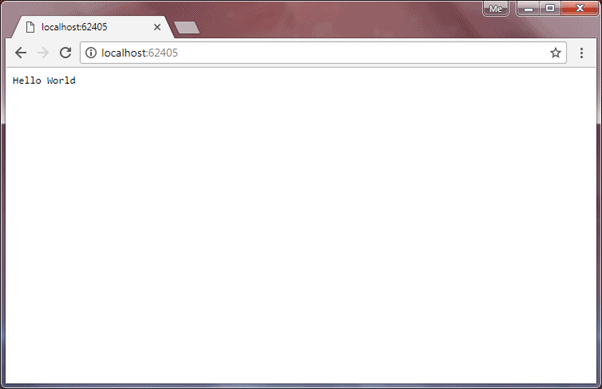 Thus, we can serve static files on http requests.